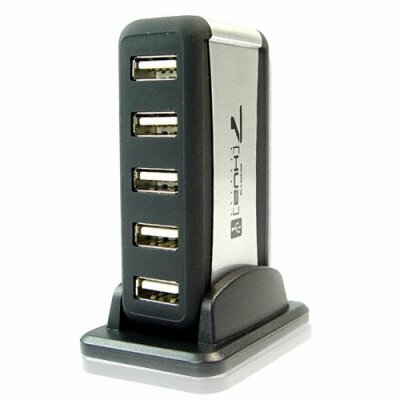 Successfully Added 7 Port USB 2.0 Hub - Support 480 Mps Data Speed to your Shopping Cart. Super useful USB 2.0 hub with enough ports to connect up to an incredible 7 different USB devices, and with lightning fast 480Mbps transfer speed. Some other unique and useful features include the ability to power the hub either directly from a computer or from a wall socket meaning you can use this computer accessory to recharge such devices as digital cameras or MP4 players in a pinch, automatic over-current protection for each port, hot swapping plug and play connection, and the ability to daisy chain up to 127 USB devices through this port if you wish. A great 7 port USB hub, with multiple and useful features, available at an astoundingly low factory-direct wholesale price. Get yours today! on 2010-11-09 15:54:55 Great product, easy to use, great help !!! Great product, easy to use, great help !!! Works Just as it should great little product.